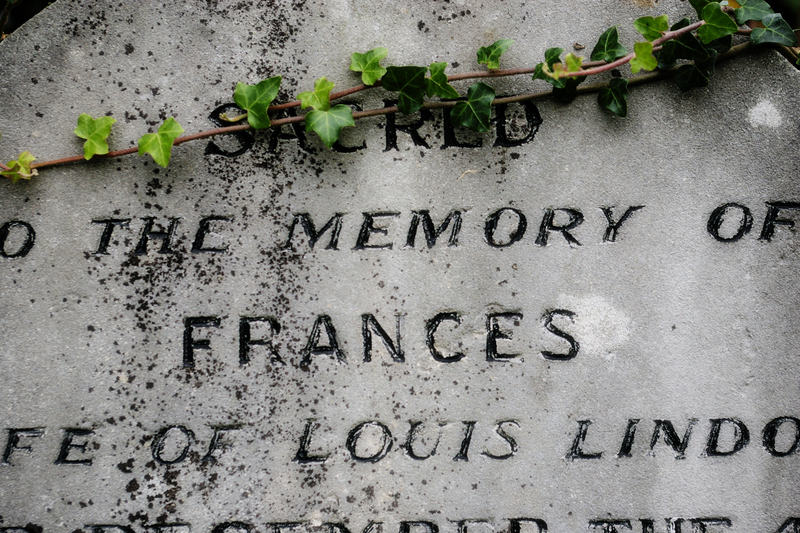 Brompton Cemetery is the resting place of Frances Lindon, better known to us and to Keats as Fanny Brawne. A general shot taken in this surprisingly photogenic cemetery. Brompton Cemetery opened in 1840, and was originally known as the West of London and Westminster Cemetery. (You can still see this name over the entrance on Old Brompton Road.) It was one of the 'Magnificent Seven' cemeteries of the era, though I feel it is more modest in many ways than some of the others. Keats' love and fiance, Fanny Brawne, mourned him for several years after he died in February 1821. Finally, though, on 15 June 1833, Fanny married Louis Lindo (later 'Lindon') and they had three children. Fanny led a quiet life, and was discreet - even secretive - about her engagement to Keats. Her husband might never have even heard of it, if he hadn't been curious about a portrait of Keats that was displayed in the Dilkes' home, and she only told her children towards the very end of her life. Despite this, Fanny kept all her Keatsian treasures safely, and she wore his engagement ring all her life. Fanny died on 4 December 1865, at the age of 65, and was buried in Brompton Cemetery. Her husband Louis died on 21 October 1872, and was buried in the same grave. The headstone was originally inscribed 'Sacred to the memory of Frances wife of Louis Lindon', with the date of her death, and Louis's name and details were added below on his death. Intriguingly, though, someone has since added the name 'Fanny Brawne' to the stone, with no further explanation. This wouldn't have been done in Louis's lifetime, and it seems to me unlikely to have been added by her children. It looks a little newer than the earlier engraving, but not much, and the letter-forms are slightly different. But the point is that someone, at some stage, felt the need to acknowledge her by the name that Keats knew and loved. 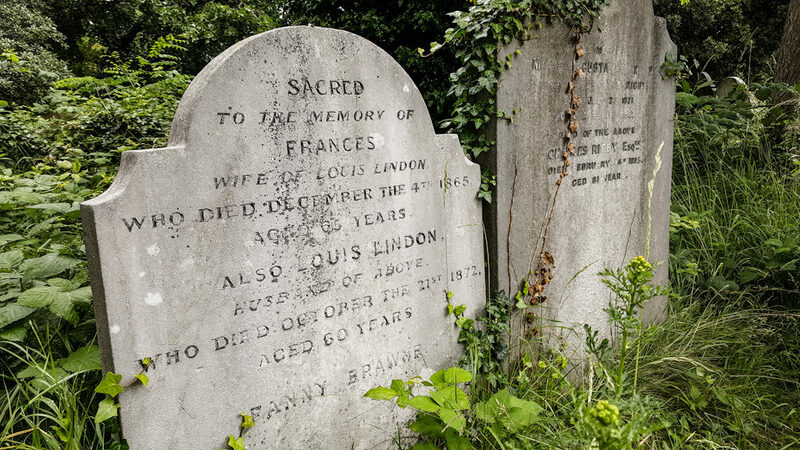 Frances and Louis Lindon's shared headstone. 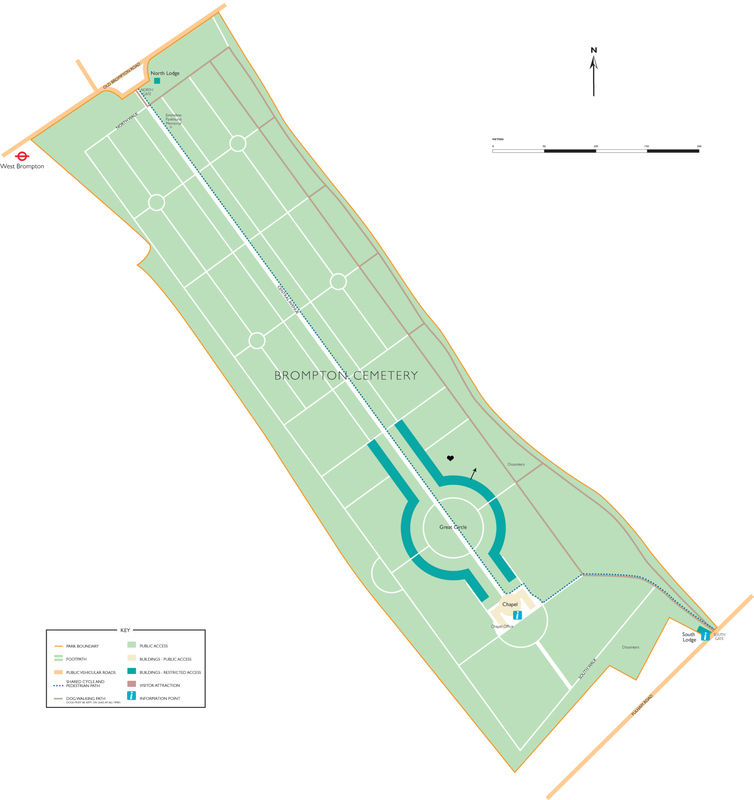 Brompton Cemetery is designated Grade I on English Heritage's Register of Parks and Gardens. It is the only Cemetery in the country owned by the Crown and managed by The Royal Parks on behalf of the nation. The Cemetery has been popular with filmmakers, and can be seen in The Wings of the Dove (1997), Johnny English (2003) and Stormbreaker (2006) among others. Walk down the outside of the colonnades, on the north side. Follow the curve as the straight avenue branches out into the Great Circle. There are large ornamental archways at each quarter of the circle. Find the one that points just a little east of north (if you're using a Real Life compass). Or, if the Great Circle is a clock-face with 12 in the direction of the North Gate, then find the archway that is halfway between 1 and 2. With your back to the archway and the Great Circle, you'll see a little dirt path leading off into the graveyard. (See the arrow I've marked on the map below.) Follow the track until you reach a tree; about three grave-lengths. 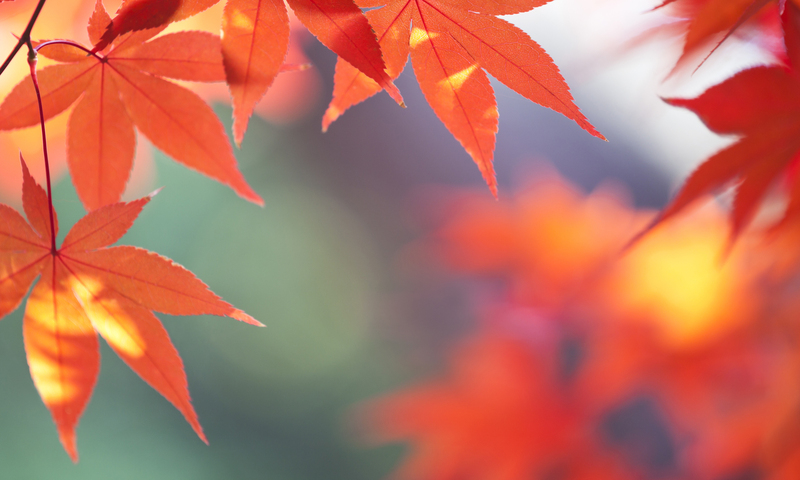 Aim for a small-ish deciduous tree, which has branches literally reaching towards her. The other trees in the area are large and evergreen. You'll come to a place where the alignment of the graves straightens up, roughly equivalent to where the proper path and the colonnades become straight. Pay your respects, and of course treat yourself and all the inhabitants with care. 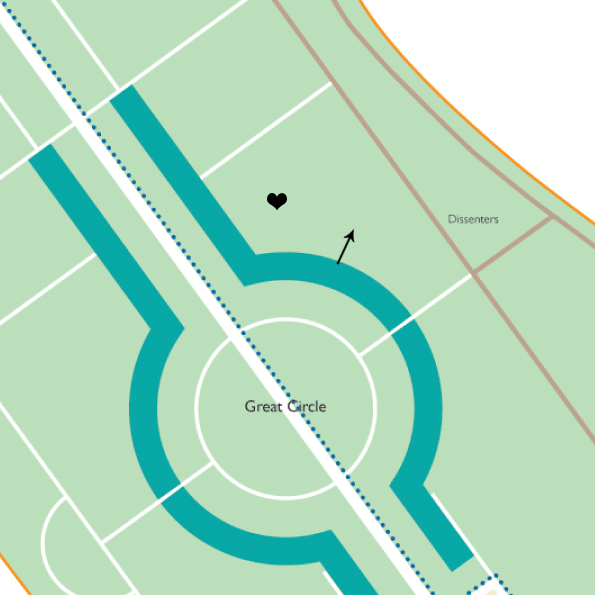 Zoomed-in and annotated map of Brompton Cemetery, borrowed from The Royal Parks. Click for the full version! Much of the Cemetery is easily accessible and all on the level, so it should prove a doddle to visit for just about everyone - though you need to be able to cope with uneven ground to read Fanny's grave. 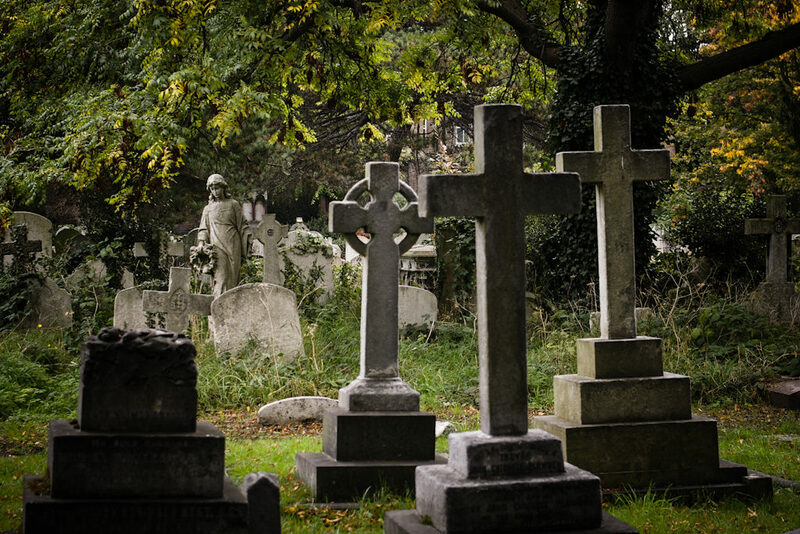 The District line runs alongside the Cemetery. As you come out of the West Brompton Tube station, turn right, and walk along Old Brompton Road until you reach the North Gate; it's only a couple of minutes away. The South Gate of the Cemetery is on Fulham Road. Opening hours: The Cemetery is open every day during daylight hours, though closes early during winter. Check the official website for details before making plans! Entry is free.